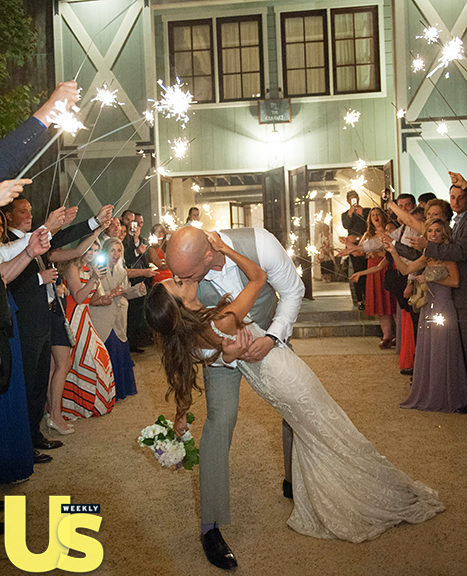 Jana Kramer Weds Michael Caussin: Inside Their Picture-Perfect Ceremony – Watch Their Vows, First Kiss, and More! Nothing but picture-perfect for Mr. and Mrs. Caussin! Jana Kramer and her football player beau Michael Caussin wed in Charlottesville, Va., on May 22, and now Us Weekly has the exclusive inside look at the country singer&apos;s walk down the aisle, stunning jewelry, and the couple&apos;s first kiss as husband and wife! Us broke news that the One Tree Hill alum, 31, and Caussin, 28, said "I do" at Pippin Hill Farm & Vineyards, which was planned and designed to perfection by Amore Events by Cody. The lovebirds exchanged vows in an outdoor ceremony and then celebrated (sparkles included!) well into the evening. Kramer stunned on her special day in a fitted Galia Lahav wedding gown, Jessica Williams for Alvina Valenta veil, and was draped in Casa Reale diamond earrings and a Pasquale Bruni diamond tennis bracelet. She was joined by her bridesmaids — clad in Weddington Way — by her side. Her handsome love, meanwhile, donned a sharp Elevee by Jen Duran suit. "We&apos;ve gathered here this afternoon to celebrate a commitment of love. There has been a lot of planning, a lot of preparation, and a lot of prayers that have gone into this very moment," Pastor Pete Wilson said at the altar. "And I think what we all can&apos;t wait to see is just what that&apos;s going to look like when those two forces to come together." Luckily, the guests didn&apos;t have to wait too long! The newlyweds looked over the moon as they made their way into a barnyard for their reception, filled with twinkling lights, lavender decorations, and rustic tables and chairs by MS Events. After their memorable first dance, the "I Got the Boy" singer (she sure did!) and Caussin then indulged their sweet tooth with a yummy lavender infused Wildflour Fine Baking Co. cake with sugar flowers. For more on the couple&apos;s gorgeous nuptials, watch the exclusive video (made by East West Production) above!